Students who receive scholarships at Stonehill routinely reach out to their benefactors with personal thank you notes about their college experiences. However, if a benefactor has passed on, the recipient often has no one specific to thank. With Celia’s permission, below we share her words of gratitude. I would like to offer sincere thanks for your generosity in awarding me the Anheuser-Busch Scholarship for the academic year 2017-2018. When I learned that I would receive this gift, I was honored and grateful, because it will help me continue my education, which has already proven to be valuable beyond measure. It has given me wisdom, knowledge, relationships, and experiences that I would not have had access to anywhere else. When I entered Stonehill, I was not sure what I wanted to study, and I had no long-term career plans. 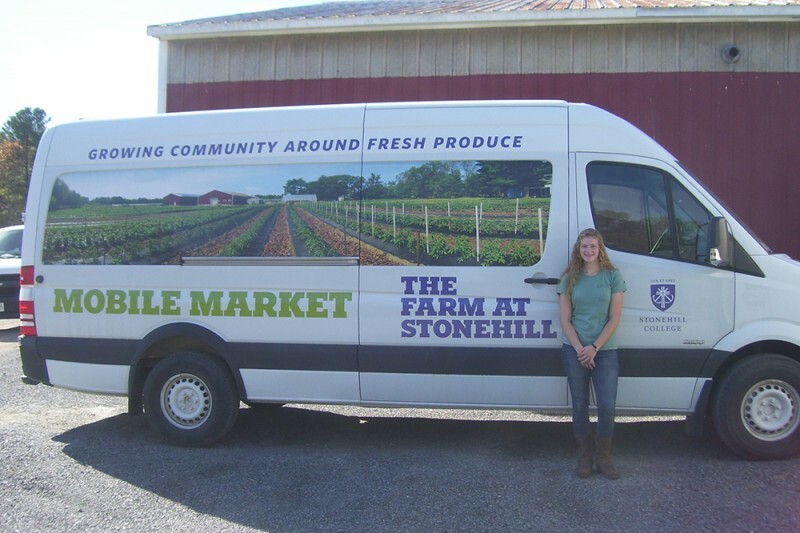 After working at the Farm at Stonehill over the summer, though, I discovered that I love being involved with agriculture. As a result, I declared a major in environmental studies, and declared a business minor with the hope of one day starting my own sustainable farm. Outside of the classroom, I try to be involved on campus in various capacities. I am an outreach minister for the Moreau Student Ministry program. I’ve attended Catholic school my entire life, so my faith is important to me. In college, I wanted to find a community that would help me improve my relationship with God. Stonehill has met that need, and I am grateful for it. Being a Moreau Student Minister has introduced me to a wonderful group of peers and faculty. I am also Regent of Stonehill’s campus court of Catholic Daughters of the Americas (CDA). We have biweekly meetings to plan fundraisers and donations to help those in need, living out our motto, “Unity and Charity” with a focus on the seven pillars of the CDA: family, education, youth, spiritual enhancement, quality of life, legislation, and leadership. Beyond my faith, I am involved in other clubs and associations on campus. I’m a member of the hand bell choir. 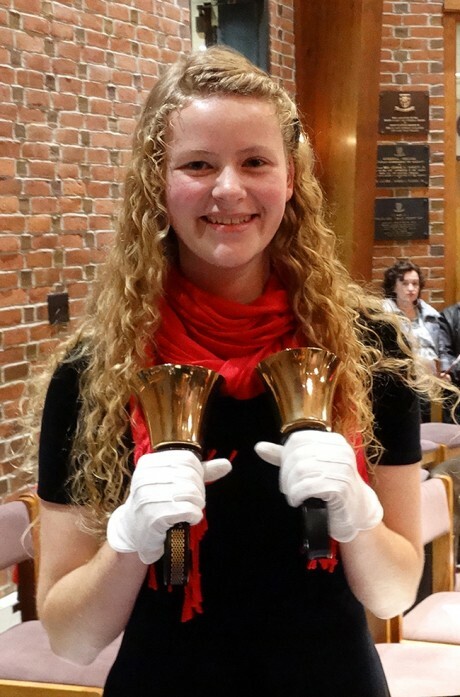 Before coming to Stonehill, I had never played hand bells. However, I have thoroughly enjoyed being part of this group. It’s a lot of fun to work with an instrument that is individual, yet also involves collaboration with other students for the song to take shape. I am also a writing consultant in the Center for Writing and Academic Achievement (CWAA). The CWAA has been a chance for me to connect with more people on campus, share my love of writing with them, and help them see the value in their own work. My time in the CWAA reflects how important my education is to me. In my short time at Stonehill, I have learned what an enriching community it is. I’ve found a home here, and friends and nurturing staff to guide me in my journey. I am not sure where this journey will end, but I know that the years I spend at Stonehill will be irreplaceable. The connections that I have made, and will continue to make, will enhance my relationship with God, and my love of life. Without Stonehill, I would not have worked at the farm and formed a career goal; I would not be part of excellent organizations, like Moreau Student Ministry, the CDA, and the CWAA; I would not have made remarkable friends and memories; I would not be receiving a rigorous education and would not be challenging my mind in classes every day. I am blessed to be part of Stonehill, and it is because of your generosity that I am able to continue on this path. People like you help make Stonehill the cherished place that it is. Therefore, I cannot thank you enough for your selflessness; you have helped me appreciate the time that I spend here, both this year and for years to come when I can think of your kindness. Thank you again for your generosity. May God bless you! Established to honor their famed marketing executive Michael J. Roarty, who died in 2013, the Anheuser-Busch Scholarship has helped 10 students obtain a Stonehill education. It is one of close to 250 named/endowed scholarships that benefit Stonehill students every academic year.